"Bob came to us as one of the leading experts in the areas of alumni relations and annual giving. We have collaborated on two alumni surveys and have been continually impressed with his work and its results. Thanks to his expertise, we have developed a much more complete understanding of alumni awareness and preferences with regard to our alumni programs and services. And, as a result, we have been able to enhance existing programs and services and develop new offerings that better meet the needs of our alumni." In March, 2004 Bob served as the keynote speaker at the University of Memphis Alumni Association Vision Forum. The day-long event combined a review of alumni relations best practice and focus group sessions with U of M alumni. 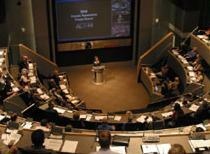 The event was held at the FedEx Institute of Technology and attracted a Tiger alumni crowd of more than 200. Bob Burdenski uses email and standard mail surveys to help institutions learn about donor and prospect giving attitudes and preferences. Alumni relations programs use Bob's survey methods to track alumni expectations, perceptions and satisfaction with programs and services. He utilizes standard survey analysis tools to examine response frequencies, means and averages, cross-tabulations of survey variables and other data elements to gain insights into the particular giving attitudes and opinions of each institution's own distinct prospect base. One-time surveys provide a useful window on prospect giving interests and preferences. Periodic repeat surveys provide a cost-effective and quantifiable measure of institutional progress in changing and shaping prospect opinions and perceptions. What programs and services do our alumni want? How does class year and age impact giving attitudes? Is anybody reading our annual report? How does previous giving impact current attitudes and opinions? Does geography impact opinions about giving? Do alumni who enjoyed a positive student experience contribute more? Which groups of prospects tend to make unrestricted gifts? Who prefers to make gifts that support students? 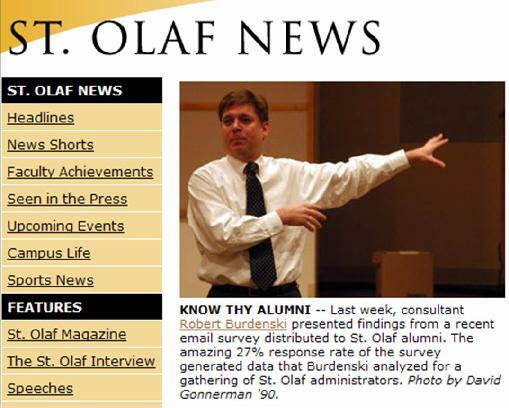 Do alumni care about U.S. News and World Report rankings? What’s the biggest deterrent to giving among younger alumni? Do you already have survey data from Zoomerang, ClassApps or another web survey provider? Bob can help you learn more from your surveys with his special analysis tools that allow for multiple-cross tabulations of variables, isolations on key demographics, mean and median calculations and others. Before you conduct another survey - learn more from the survey data you already have!